How ironic that the day set aside to honor Dr. King is only a few days before the anniversary of the Supreme Court’s Roe v. Wade anniversary. What would he say? Alveda King, the niece of MLK and a dedicated pro-life advocate, notes her uncle was strongly pro-life. “Were he alive today, he would be working to secure peace and justice for those in the womb and healing for a nation that is still pained by over 53 million missing lives,” King says. The toll abortion has taken on the African American community is enough to shock the conscience of every American. According to the US Census Bureau, African Americans comprise 12.4% of the American population; however, over 30% of the nation’s abortions are done on black women. Recently released data from the New York City Department of Health shows the Big Apple hitting a 40% abortion rate. As if that number wasn’t appalling enough, when the data is broken down all racial lines, around 60% percent of New York City’s abortions are done on black women. In other words, 1,448 African American babies are aborted for every 1,000 born. Among black teens in New York City, that number jumps to a staggering 72% abortion rate or 2,360 abortions for every 1,000 babies born. Read that. Engage this issue. Center for Disease Control data shows that since Roe vs. Wade (1973) abortion has been the leading cause of death among African Americans. More African Americans have lost their lives to abortion than to heart disease, cancer, accidents, violent crimes or AIDS- combined. Let that sink in. It’s not a coincidence. African Americans are a prime target of the abortion industry. In analyzing the location of the nation’s abortion centers, some have found a disproportionate number situated in majority-black neighborhoods. One such center was that of Kermit Gosnell, the disgraced abortionist from Philadelphia who is now charged with murder after the deaths of at least two women and seven newborn infants at his facility. According to the Grand Jury report, the Gosnell abortion business preyed upon low-income black women. These women were subjected to absolutely deplorable conditions. Basic health considerations were ignored and abortions were being performed by unlicensed and even untrained staff using unsanitary surgical instruments. That trial should have made a huge difference, one that’s bee overdue for decades. The Gosnell case made national headlines but his business strategy of targeting low-income black women is not an anomaly in the abortion industry. This goes back to the beginning of the modern pro-abortion movement with Planned Parenthood’s founder Margaret Sanger, an unabashed eugenicist. Despite its claims otherwise, the pro-abortion movement does a grave disservice to African American women and the greater African American community. Abortion advocates fail black women when they rally against common sense clinic regulations, which could have prevented the Gosnell tragedy. They fail black women when they work to undermine crisis pregnancy centers, which are an invaluable resource for so many low-income black women. And they fail the African American community by denying basic humanity to black babies in the womb. Martin Luther King, Jr. boldly envisioned an America in which everyone would be free to share in the same opportunities as everyone else. In legalizing abortion-on-demand, the Court ruled that a group of people, namely unborn children, did not deserve any legal protection whatsoever. For this reason, Roe vs. Wade is completely antithetical to King’s Dream. Abortion has not made our society more equitable. In fact, it has done the opposite. Abortion has allowed society to arbitrarily decide whose lives are valuable and whose are expendable. True equality treats all human life the same, regardless of race, stage of development or condition of dependency. Abortion prevents millions of African Americans from sharing in King’s Dream and it must be ended. That’s why they march, the pro-life movement who began giving voice to the voiceless on the first anniversary of Roe. Like King, they never gave up and never will. In fact, their ranks are only growing larger and younger and more determined. They’ve spread from the annual Washington DC rally and March for Life throughout the country to the West Coast Walk for Life. The Chicago March for Life held last Sunday had a tenfold increase in participants over last year, and they were loud, joyful, exuberant, determined, happy, hopeful, positive, and very supportive. The plaza erupted at just about everything any speaker said, starting with the young African-American woman who was pressured to have an abortion but looked into a pregnancy help center where she found support and everything she needed to keep her baby, which wound up being babies when she learned she had twins. The beautiful little girls, Amelia and Olivia, were with her on stage as she spoke of hope and life and aid for women. Two congressmen, Democrat Dan Lipinski and Republican Peter Roskam, spoke of bipartisan support for the protection of all human life and women’s health in Congress. They were brief but powerfully moving, invoking predecessors in the cause of human rights, including the drafters of the Declaration of Independence. Dr. Martin Luther King invoked that, too. On many occasions. Because the majority of Americans still hold those truths as self-evident. 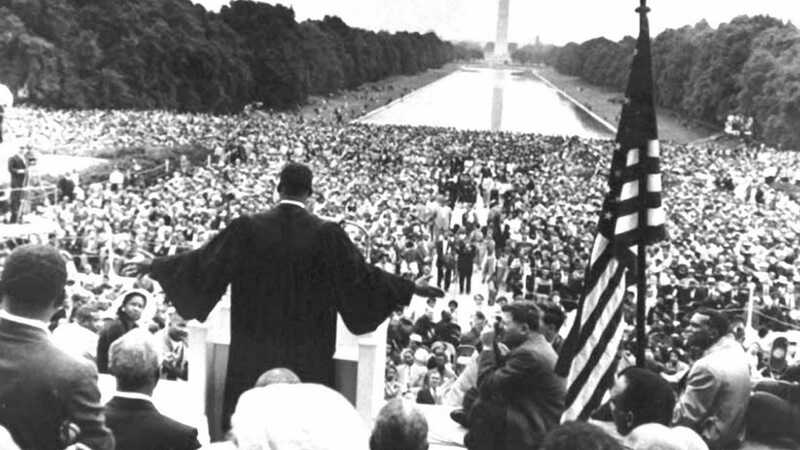 In one of his lesser known addresses, ‘Our God Is Marching On’, King explained why he and his movement marched. And then “the conscience of America began to bleed.” And as a result “of this democratic spirit,” the nation finally forced Congress to write legislation in the hope that it would eradicate “the stain of Birmingham”, of discrimination of a whole class of human beings by another class. And that legislation gave them some degree of “their rightful dignity”. Once more the method of nonviolent resistance was unsheathed from its scabbard, and once again an entire community was mobilized to confront the adversary. And again the brutality of a dying order shrieks across the land. Yet, Selma, Alabama, became a shining moment in the conscience of man. If the worst in American life lurked in its dark streets, the best of American instincts arose passionately from across the nation to overcome it. There never was a moment in American history more honorable and more inspiring than the pilgrimage of clergymen and laymen of every race and faith pouring into Selma to face danger at the side of its embattled [Blacks]. At the side of its embattled, oppressed fellow human beings discriminated against and denied human rights by a class of human beings who had the legal right to do so, until those laws changed. That’s why they marched then, said Dr. King. That’s why they march today. That’s the issue dividing pro-life groups, in other words. Not the words of the New York Times, which prominently featured this story on the front page above the fold in Monday’s edition. Let’s look at what they said and how they said it. A widening and emotional rift over legal tactics has split the anti-abortion movement, with its longtime leaders facing a Tea Party-like insurrection from many grass-roots activists who are impatient with the pace of change. Now that they’ve changed their style-books to refer to pro-life people only as “anti-abortion”, what does the NYT and other big media call the pro-abortion movement (just for parity of language, we should assume that’s what they are as the opposite of anti-abortion forces)? They’re usually called “pro-choice.” As if that has any defining properties. 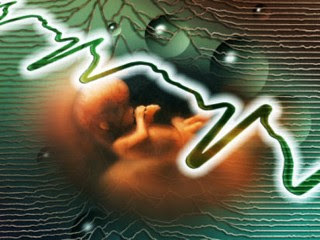 For decades, established anti-abortion leaders like National Right to Life and Catholic bishops have pushed for gradually chipping away at the edges of Roe v. Wade, the 1973 Supreme Court ruling that legalized abortion, with state laws to impose limits on late-term abortions, to require women to view sonograms or to prohibit insurance coverage for the procedure. But now many activists and evangelical Christian groups are pressing for an all-out legal assault on Roe. v. Wade in the hope — others call it a reckless dream — that the Supreme Court is ready to consider a radical change in the ruling. The rift widened last month over a so-called personhood amendment in Mississippi that would have barred virtually all abortions by giving legal rights to embryos. It was voted down but is still being pursued in several states. By calling the growing human life in the womb of the pregnant mother an “embryo” the aim is to dehumanize the human being. And the cynical reference to the legislation as the “so-called personhood amendment”…what’s that about? Diminishing its validity, for starters. Now, in Ohio, a bill before the state legislature that would ban abortions once a fetal heartbeat is detectable, usually six to eight weeks into pregnancy, is the latest effort by activists to force a legal showdown. The so-called heartbeat bill is tearing apart the state’s powerful anti-abortion forces. Why aren’t pro-abortion forces ever called “activists”? And why is the heartbeat bill “so-called”, when it’s a medical and biological reality that there’s a detectable heartbeat in the baby? Because words are important in forming public opinion, and there’s an agenda working here that has worked for decades by distorting the language. I will get back to the point the Times makes, accurately, about the rift in the pro-life movement. They need to get their act together, and there’s plenty to say about that, another time. But for now, remember the impressive list of pro-choice legal experts who declared Roe to be bad law. It was a radical ruling, and it is indefensible. It should be challenged on all levels. And btw…I heard a reference in an unusual news report the other day that made simple common sense. If the media must refer to the pro-life movement as ‘anti-abortion,’ the obvious label for the other side is the ‘anti-pro-life movement.’ That’s calling it what it is. Graphic images on news shows and television commercials rightly rouse us to horror and indignation. Imagine if those tortured and disfigured creatures were helpless humans. That’s the thought that occurs every time I see this new ad for an anti-cruelty organization, filled with closeup photos or videos showing the ravages of harsh treatment by their owners. These commercials assault our sensibilities, but that makes them effective. Accompanying these images, the voiceover says “no animal should be treated cruelly, abusively or inhumanely”…And then adds: ‘but they don’t have to, with our efforts to save the animals at (website plug)’. For crying out loud. No human should be treated that way. Let’s start there. I love animals. Really, really love nature and animals and that means just about everything except skunks and snakes, rats and other rodents, and some insects like spiders (I just wish they hadn’t made the ark). I love our dogs as part of our family. I get it, I really do. But do the animal activists get human cruelty? I’m not a proponent of pro-life demonstrations of graphic images of aborted babies. I understand the belief that ‘Americans won’t reject abortion until Americans see abortion’, as one prominent leader (and friend) frequently states. Maybe true. But I don’t go about promoting human rights and dignity in quite that manner. However, this new television ad campaign is provoking the instinct that if graphic images of brutalized cats and dogs should stir up outrage and the rush to send relief, how much more so the cause of rescuing brutalized human beings who are even more vulnerable…and more brutalized, being tortured as they’re put to death. In abortion. Really. It’s just that stark. It takes an open and intelligent mind that always seeks truth, willing to go wherever that leads. Becoming a parent also helps. One of the things I love about this book I’ve been reading, The Appalling Strangeness of the Mercy of God, is its high-level of reasoning and engagement of critical thinking. I wasn’t exactly prepared for that when starting what I already knew was a touching biography about an exceptional life, the one Michael Pakaluk wrote about his wife Ruth after she died. I have never read a more beautiful and touching book – a book about a joyous life and overpowering death, and grief and joy. Michael and Ruth Pakaluk’s account of love and grief towers head and shoulders above the justly acclaimed accounts of C.S. Lewis in A Grief Observed and Sheldon Vanauken in A Severe Mercy. Wow. High praise. And more from Dr. Peter Kreeft, a brilliant philosopher who knew Ruth Pakaluk well. Early into the book, I saw why. 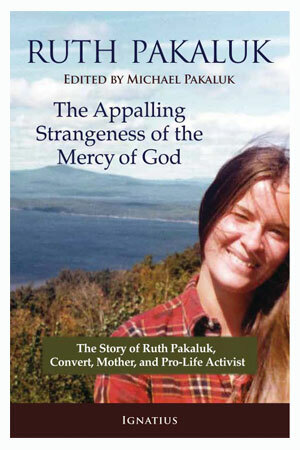 Ruth Pakaluk entered Harvard an atheist and “enthusiastically pro-choice”, according to her husband Michael in his narrative that opens the book. They met and married while at Harvard, and together made their way through an eager intellectual and spiritual journey to the Christian and then Catholic Christian faith and the reasoned belief in the sanctity of all human life. Which was a rare journey in the higher echelons of academia, they discovered. Ruth and I were astonished to witness this discourtesy and hostility to free discussion. We couldn’t understand why everyone wouldn’t immediately agree with [a] very reasonable proposal [for revising a state law]. But what most disturbed us was that on a university campus – supposedly dedicated to learning – those who disagreed with the speaker weren’t interested in arguing with him but instead tried to drown out intelligent discussion. In debate she was so effective that abortion rights activists often refused to go up against her. She was a force to be reckoned with, and the reckoning meant resorting to reason, and opponents in the debate wouldn’t or couldn’t do that. But she kept on. After Casey, then, Ruth changed her efforts in the direction of influencing the culture, especially influencing individual hearts and minds through education. Without drama or emotion, Michael weaves the straight-line narrative of Ruth’s journey that was loaded enough with both, the emotion of becoming the mother of seven children with all the drama of a dynamo managing home and family, while also managing political campaigns and educational initiatives and pro-life movement strategies. It was actually having a child that converted her to the view that her highest calling was to be a homemaker – and from her descriptions of her first child it is evident that she was deeply in love with him and that therefore the central question of her daily life became how she might make life best for him. That struck home, in the heart, as the same thing happened to me, and hapened again with my second son. I have read and debated much about abortion, but I have never seen a clearer and stronger pro-life argument than Ruth’s. And that’s intriguing, coming from Kreeft especially. The core of Ruth’s argument about abortion and human rights may be summarized in this way: Human rights are rights that pertain to us simply in virtue of the fact that we are human, not for any reason above and beyond that; the fundamental human right is the right to life, and so, if that right is denied, then all human rights are in effect denied; the thing growing in the mother’s womb is surely alive (otherwise it would not need to be killed by an abortion), and it is human; thus, to deny that the thing growing in the mother’s womb has the right to life is to deny that anyone has any human rights whatsoever. There it is. The clarity of logic and reason, and the beauty of truth. Ruth came to a turning point in her search for the truth about abortion “in the used book section in the basement of Harvard Book Store,” when she came across one particular book by “a firm advocate of tax-funded abortion on demand throughout all nine months of pregnancy,” as Michael writes. I invite you to meet a warrior for life whose pen is truly mightier than death’s sword. That was the subject of discussion on an hour of radio dedicated to changing the terms of debate between people who are pro-life and those who are pro-choice. Or even starting one….since both groups have been largely talking to themselves for decades. For pro-life media people to even concede to use the term ‘pro-choice’….and hopefully vice-versa….is a start. Style books have been changed over the years to write off the terminology of the ‘other’ as to render it invalid as a thought. I had the benefit of hosting two guests on radio Monday who brought the freshest thinking to the table of discussion about how to uphold human dignity that I’ve heard in a while. Eric Scheidler said he had a passion for fostering “the right spirit of patient listening and peaceful dialogue” to advance the cause of respecting life. 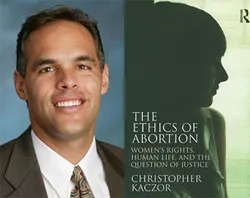 Dr. Christopher Kaczor devoted his latest book to that dialogue, and its foundation. ‘The Ethics of Abortion’ provokes. What reproductive rights do women have? Who decides? Is abortion the intentional killing of an innocent human person? Is abortion just the termination of a mass of cells with no more significance than a guppy? Does affirmation of female equality lead to abortion rights? does personhood begin after birth? Does personhood begin with birth? 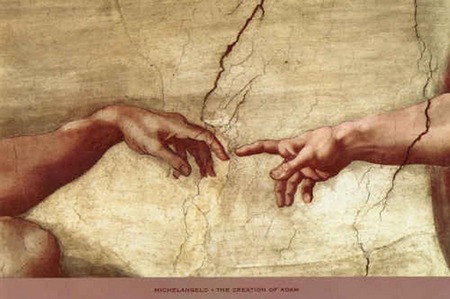 Does personhood begin with conception? Is abortion permissible even if the fetus is a person? One could be 100 percent committed to a strong pro-choice view, and not judge as evil those who work to oppose abortion. Similarly, one could be 100 percent committed to a strong pro-life view, and not judge as evil those tho have had abortions. Whatever one’s view of abortion itself, refraining from making judgments about the character of those touched by abortion (in whatever way) is helpful in treating the topic properly, and more importantly…that it is an essential part of being a decent human being. Build a culture of life. Be a martyr if necessary. Denver Archbishop Charles Chaput said that recently, speaking to a gathering in Fargo, North Dakota. In order to succeed in the goal, pro-lifers must be willing to become martyrs, he said. “In the America of our lifetimes, we may never be asked to shed our blood in witnessing for our faith. But we do see character assassinations, mud-slinging and lies used against good people every day in the public media. And we should be ready to pay the same price. Nothing, not even our good name, should stop us from doing what we know to be right,” emphasized Chaput. And don’t worry about how much money the pro-life movement doesn’t have, he said. Use whatever you’ve got to renew the culture. He assembled a list of “do’s and don’ts”, and delivered it with strong encouragement to get out there and stay busy. It reminds me of a remark Chicago’s Cardinal Francis George made to pro-life citizens about this very thing, and he urged them to encourage members of elected government. “Pray for them, and tell them you’ve got their back.” Struck me as a good reminder for people on the frontlines of a very big battle. I cannot explain the pop cult phenomenon of this young man and his meteroric rise to fame and his sensational following. But if he suddenly drops off the velocity meter or falls off the bubble…..I can probably tell you why. Justin Bieber is pro-life. We know, because he was asked. Teen singing sensation Justin Bieber made national waves this week by expressing his pro-life views on abortion, but Rolling Stone magazine has admitted it withheld a portion of the comment that makes Bieber’s pro-life views more firm. “Um. Well, I think that’s really sad, but everything happens for a reason. I don’t know how that would be a reason. I guess I haven’t been in that position, so I wouldn’t be able to judge that,” is what Bieber actually said. Now, the magazine has issued another update of the quote — one that makes it clear Bieber believes the unborn child is a human being. They called it an “editing error.” Maybe they wanted to spare Biber the backlash his views would launch? In the wake of Justin Bieber’s pro-life remarks in an interview with Rolling Stone magazine, pro-life leaders are urging widespread support for the young pop superstar, saying its only a matter of time before he comes under attack for his defense of the unborn. No they didn’t. They were just, simple, remarks. Reactions like that are projecting the real entrenched message. The Supreme Court ruling legalizing abortion in America turns 38 today. It’s getting old. The argument for “choice” is losing a significant amount of whatever credibility it had, and it had that as a result of a concerted marketing campaign of deception, truth be told. The cumulative effect of abortion leaders, providers and survivors coming over to the pro-life movement with the gravity of their experience and awareness and witness has been a reversal of public acceptance of abortion laws in recent years. So did the pro-abortion American president keep a low profile on the anniversary of Roe v. Wade? Not exactly. President Barack Obama is marking the 38th anniversary of the Supreme Court’s landmark decision on abortion by calling the procedure a constitutional right he’s committed to protecting. Let’s be honest. The truth about abortion is becoming clearer. There is an obvious tension between thinking that unborn children are in some sense human lives worth saving, and also thinking that these human beings should have no formal right not to be harmed. Anti-abortion activists will participate in an annual “March for Life” in Washington on Monday. The secular media changed their style books to help that linguistic engineering of public opinion a while back. Better stated, the pro-life movement will hold the annual “March for Life” in Washington on Monday. If the media can’t get around to covering it, they’ll have lots of help this time from the armies of young people ready to text and tweet live updates.